HERE WE GO. 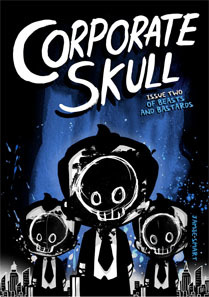 Corporate Skull issue two begins today with a big fat six-page opener (six if you count the cover, yeah? ), Just enough to start us off in a few different places and get back to Skull at the end. If you’re reading this on RSS or something, i hope it hasn’t uploaded screwy or out of joint – the first five pages were backdated (i find this the easiest way to do it with the way Comicpress is set up). If you’re new to Corporate Skull, why not start by reading the whole first issue to see how we got to this terrible sweary place. So issue two is where things start getting fun. While I needed issue one to show the origins of Skull, issue two will start to show how he fits into the world. And more than that, it’ll start to take the series in the direction it’s going to go, something which hasn’t really been indicated yet. 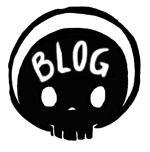 If you think this is all about a Skull working in an office, thats only a tiny part of it, and the end of issue two will start opening it all up. In the meantime, please do enjoy! And if you enjoyed, comment or share it around. The support for issue one was pretty overwhelming, and very appreciated, thanks so much!